This steel and carbon fibre sculpture (2011) by New Zealander artist, Phil Price is located on the Redcliffe, Queensland foreshore. “The concept around OPTO revolves around looking and changing. Looking promotes a sense of place – we can look out over the bay, from the land to the sea, and we can look back to the land, from the sea. Looking can also be interpreted as a metaphor – we can look into the future or back into the past. The form of the sculpture represents a portal – we look through it to a framed landscape, observing the natural and man-made world via the circular scope. Designed to act as a metaphorical portal, the kinetic rings move in direct relationship to the environment, rotating and spinning in response to the breeze from Moreton Bay. Passing over one another, they appear to open and close, changing the framed landscape within the circular form. OPTO serves as a celebration of this beautiful place: past, present and future. Phil Price is best known for his kinetic sculptures with many located across New Zealand and Australia. 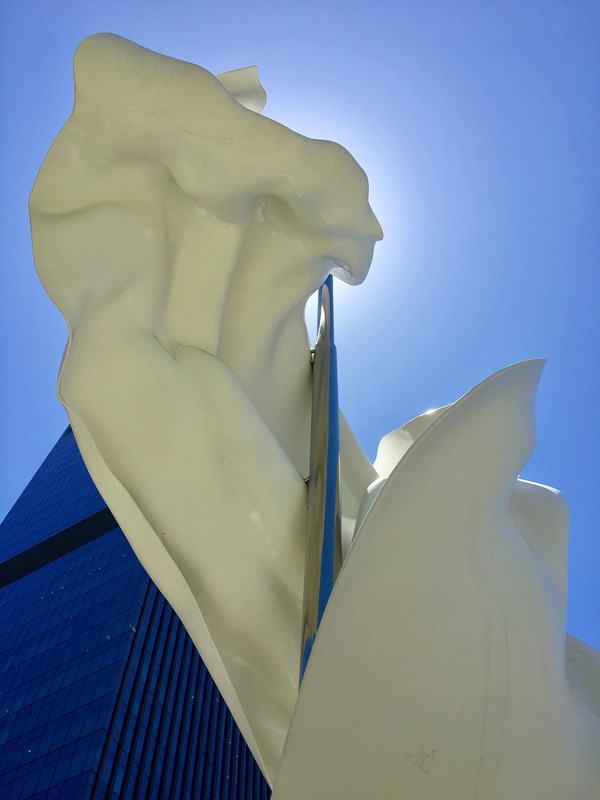 Regarded as the foremost kinetic sculptor of his generation, Phil’s work is widely acknowledged for its breathtaking beauty and extraordinary design. 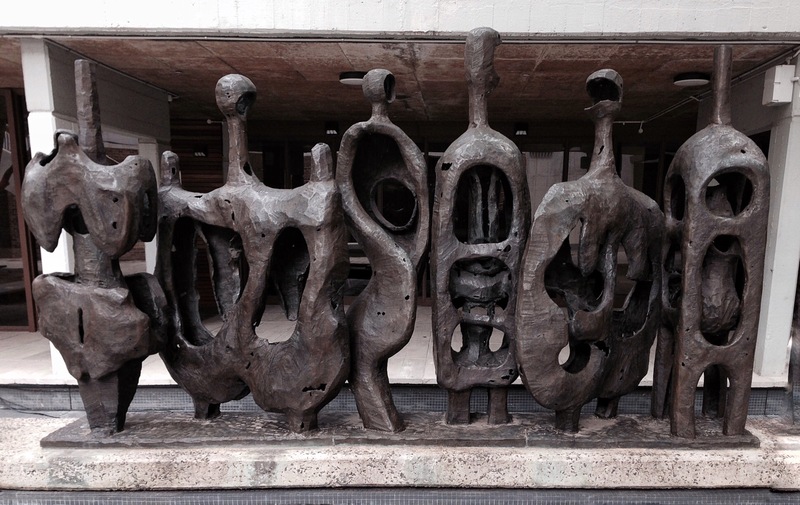 Untitled bronze sculpture, group of figures by Bert Flugelman, 1964, UNSW Sydney, Australia. Taken while traversing the University campus. In a previous post I wrote about my dilemma of finding the best way to travel to work on public transport. I think I have the answer. The M10 from Leichhardt runs around every ten minutes in the morning. The journey time is between 45 minutes and one hour, depending on traffic. This trip pays a dividend in the form of exercise time. Ten minutes walking from home to bus stop on the flat followed by ten minutes through campus, mostly uphill. According to The Conversation I need to walk at a moderate pace for at least 30 minutes for five days per week. The remaining 10 minutes can be achieved on the trip home by either alighting two stops early or catching buses whose routes don’t pass the end of our road. Any walking I do during the day is a bonus! Steel sculpture of two paper aeroplanes by Australian sculptor, Jonathan Leahey. 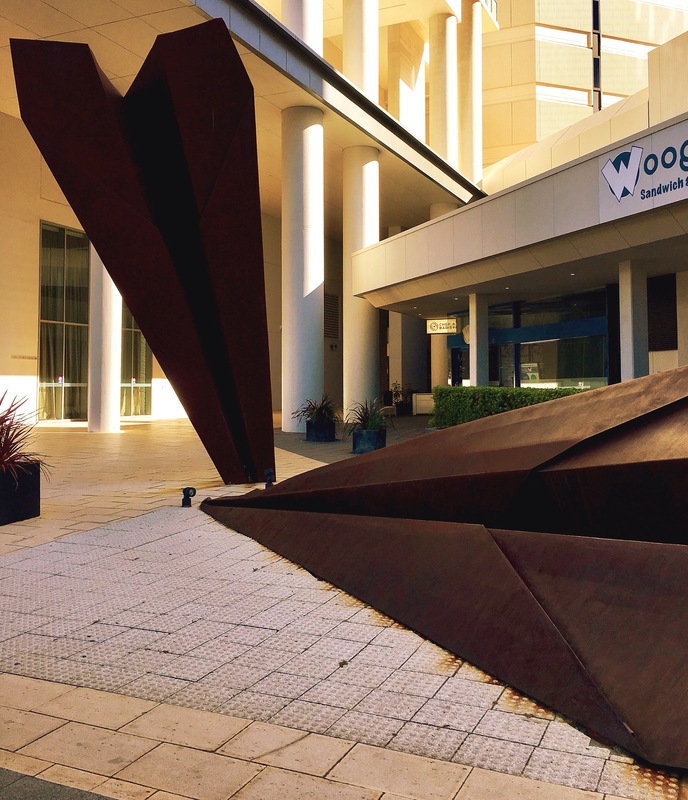 The eight metres long planes are located at 249 Adelaide Terrace, Perth. The challenge of getting the planes airborne flashed through my mind while taking the photograph. I reflected on the upcoming 19th anniversary of our landing in Australia. While we have been back to the UK to visit family and friends a number of times over the years, Australia is our home. Detail of Ascalon, a contemporary representation of the legend of Saint George and the dragon. It is located in the yard of St. George’s Cathedral, Perth, Australia. The work is designed by Western Australian artists Marcus Canning and Christian de Vietri. Saint George is the patron saint of England. He is reputed to have slain a dragon in the Middle Ages. The story is likely to have emerged from the Middle East, being carried back to England by the Crusaders.